Washington D.C. August 23, 2005 - Next week, if all goes according to plan, the United States will resume six-party talks with North Korea, South Korea, Japan, Russia and host nation China on the issue of North Korea’s nuclear program. The parties are trying to reach agreement on a set of principles to guide negotiations that will lead to the dismantling of Pyongyang’s nuclear program and the threat it poses of a destabilizing North Korean nuclear weapons arsenal. This will be the fifth round of these talks, which were initiated at the invitation of China in 2003 to address the crisis created in October 2002 when U.S. envoy James Kelly accused the DPRK of violating the terms of the 1994 Framework Agreement that was supposed to halt that nation’s nuclear weapons program in exchange for provision of light water reactors to North Korea to meet its growing need for energy. Since 2002, North Korea has withdrawn from the NPT and earlier this year claimed to have nuclear weapons, the number of which has been placed at six by U.S. and other intelligence sources. These talks illustrate a set of recurring themes and issues that run through the efforts by the U.S. and its partners to bring North Korea to the bargaining table and secure a binding commitment that will effectively end the nuclear threat posed by the DPRK. First of course is the challenge of reconciling North Korea’s emphasis on addressing what it sees as the bilateral security issue between itself and the U.S. with the emphasis placed by the U.S. and its negotiating partners on multilateral talks in which North Korea’s neighbors take much of the lead in pressing North Korea to come to an agreement. Second is the challenge of coordinating national positions among the U.S. and its partners, highlighted by the apparent split between Washington and Seoul on the legitimacy of Pyongyang’s desire for a civilian nuclear energy program. Third is the role played by North Korea’s economic situation in pushing that nation to the negotiating table and any eventual agreement. The cycles of optimism and pessimism in U.S.-North Korean relations. The first document demonstrates the optimism, albeit cautious, that marked the view of the Bush I State Department about the prospect for continued positive negotiations with North Korea as the administration came to a close in 1992. By mid-1993, this optimism would be replaced by bewilderment at North Korea’s reversion to a hard-line regarding its nuclear program. The cycle would continue through the low point of the 1993-94 nuclear crisis, only to move back toward cautious optimism following the 1994 Framework Agreement and the start of peace talks. Relations would reach another high point with the North-South Korean summit and Secretary Albright’s trip to Pyongyang in 2000, only to collapse again two years later with the revelations about Pyongyang’s cheating under the 1994 agreement. The complaint voiced in one document that Washington was being whipsawed between the calls of allies such as South Korea and Japan for pursuing diplomatic solutions to the North Korean problem, and domestic pressures to take a hard line. The struggle to design a forum for discussing a framework for working on a peace treaty that would give the two Koreas the lead in reaching a peace settlement, yet also protect the interests of the other major powers such as China and Russia. The U.S. desire to preserve the ability to deal with North Korea directly on a bilateral basis to address issues such as missile sales or terrorism that would be free of "ROK manipulation," as one document put it. The double-edged sword of North Korea’s dire economic situation, which was seen as helping to motivate Pyongyang to come to the negotiating table, but which, if left unchecked, could lead to disastrous consequences in the event of a total North Korean collapse. This pitted humanitarian against diplomatic considerations, and led the U.S. to work with South Korea to "prevent the precipitate collapse of the DPRK, since it would present unacceptable military risks and economic costs…"
Assessments of North Korea’s social and political resiliency in the face of continued economic hardship, which one analysis attributed to the "continuing strength of their family-centered Confucian value system," as well as to the belief North Korea’s economic woes were grounded in millennia of imperialistic designs upon the nation. The fascinating argument put forward by Stapleton Roy, long-time State Department Asia hand, that took issue with the image of North Korea’s leaders as illogical and unpredictable. In assessing the historic summit meeting between the two Korean leaders Kim Dae Jung and Kim Jong Il in June 2000 for Albright, Roy stressed that she must realize the significant degree of continuity in North Korean policies dating back to the period of Kim Il Sung, policies that he said were not ideologically rigid, but able to change in response to changing circumstances on the Korean peninsula. Roy attributed the continued survival of North Korea, "independent and prickly," to this adaptable foreign policy, which he argued Kim Jong Il had helped to shape during his father’s rule. Following their October 2000 meetings, Secretary Albright described Kim Jong Il as, "someone who is practical, decisive, and seemingly non-ideological." This document suggests the degree of cautious optimism within the Bush administration about the future course of U.S. efforts to engage North Korea and reduce tensions and security threats on the peninsula in the wake of Pyongyang’s acceptance of a safeguards agreement with the IAEA. The memorandum summarizes a paper prepared by a departing EAP officer on next steps for North Korea. This paper assumes that North Korea will meet U.S. preconditions, leading to the start of policy-level talks within months. In preparation, the U.S. would need to discuss with Japan and South Korea an agreed framework for talks on Korean reunification, America’s role in this process, and how U.S.-North Korean normalization fits into the picture. The memorandum’s author, Charles Kartman, comments that the paper’s “assumptions, particularly regarding DPRK compliance with its nuclear obligations, may stretch available evidence…,” but he believed they were mostly on target. This CIA document belies the cautious optimism expressed in the previous document, as it seeks to explain the reversion to a hard-line stance toward the IAEA, and the planned U.S.-South Korea military exercise Team Spirit. As summarized in the analysis, Pyongyang’s “counterproductive” actions are seen as driven by a combination of historical and personal factors: the regime’s belief that in international relations compromise equals capitulation, as well as by Kim Il-Sung’s and his son Kim Chong-Il’s perception of foreign pressures as personal tests of their legitimacy. Though heavily excised, this document provides a clear picture of growing U.S. concerns over North Korea’s continued intransigence about complying with its IAEA inspection safeguards commitments. As the memorandum notes, the U.S. conditions for a third round of U.S.-DPRK talks about the North Korean nuclear program and suspending the upcoming Team Spirit military exercises had not been met, as Pyongyang was rejecting the IAEA’s inspection request and no agreement had been reached on an exchange of envoys between South and North Korea. The continuity of the IAEA safeguards on the North’s nuclear activities was degrading, as the surveillance equipment was running out of power and film, increasing the possibility that the North might be able to produce more plutonium undetected. Compounding Washington’s problems was the fact that it was being whipsawed by the views of allies and domestic critics, with Japan and South Korea pressing for more diplomacy, while pundits in the press argued for a “get tough” approach. In this memorandum, Robert L. Gallucci, who was heading the U.S. negotiations with the North Koreans on their nuclear program, lays out the state of affairs regarding the most recent North Korean actions to remove reactor rods from the Yongbyon reactor. In essence, Gallucci believes matters have not yet reached the point of no return in terms of maintaining some continuity of surveillance on the North Korean reactors, but it is clear action is needed to preserve the ability to account for the spent fuel in the North Korean reactor. Gallucci outlines a possible course of action in which a planned trip by Senators Nunn and Lugar to North Korea could be used to press home to Pyongyang that the U.S. is serious about negotiations, while the U.S. moves to publicly state its goals and specific next steps to move toward them in talks with North Korea. In this cable, the State Department provides guidance to its embassies on the results of the most recent round of U.S.-DPRK talks on the North Korean nuclear program. Calling these talks an “important step forward” in efforts to resolve this issue, the cable outlines the elements of the proposed agreements reached in principle so far, involving freezing the essential elements of the North Korean nuclear program while the talks are underway, the proposed replacement of North Korea’s graphite-moderated reactors with light-water reactor power plants, exchange of diplomatic envoys between the two Koreas, implementation of a North-South joint declaration on the denuclearization of the Korean peninsula, and U.S. willingness to provide the DPRK with assurances against the threat or use of nuclear weapons against it. Key points remaining to be nailed down included implementation of the IAEA safeguards treaty, including provision for special inspections and a full accounting of past North Korean nuclear activity, and disposition of the spent nuclear fuel from the North Korean reactor; Summing up, the cable notes the critical importance of sequencing these elements of an overall agreement, comparing the final settlement to a puzzle for which the U.S. has some, but not all, of the pieces in place. These talking points, which apparently were prepared for a discussion with Russian diplomats, summarize the main points of the Agreed Framework reached between the U.S. and North Korea to curtail the north’s nuclear program – which is termed not perfect but still a major step forward in establishing a strong nonproliferation regime on the Korean peninsula, and discusses aspects of possible Russian involvement in implementation of the agreement, particularly the provision of light water reactors to North Korea. The document also notes efforts by the U.S. to consult with its allies on the agreement, including discussions between President Clinton and his Chinese, Japanese and Korean counterparts in Jakarta, as well as the importance of continued rapprochement between the two Koreas as key to the successful implementation of the agreement. This paper, possibly prepared for trilateral talks with Japan and South Korea, summarizes the worsening food situation in North Korea, which is now viewed as being nationwide and affecting not only civilians but also military troops. The paper cites the need for consultation with U.S. allies on any response to a international appeal for aid, citing the need to consider the political ramifications of any decision to provide food assistance to North Korea. This briefing paper underscores the difficult balancing act the U.S. was attempting in working to arrange Four Power talks involving North Korea, South Korea, China and the U.S. on a possible peace agreement for the peninsula. The overriding principle for the talks is that it was for the Korean people to determine the future of the peninsula, so the two Koreas had to take the lead in negotiating any permanent peace treaty. Still, the U.S. and China have interests in the matter, so the talks were being organized to provide maximum flexibility for accommodating and expressing the views of the four parties as they discuss how to initiate a process that can lead to a final settlement. This cable provides U.S. Ambassador to Moscow Thomas Pickering with talking points for briefing the Russian government on a new U.S.-South Korean peace plan – the Four Power Talks discussed in the previous document - for the peninsula, which was to be announced by President Clinton and South Korean President Kim Young Sam during Clinton’s upcoming visit to South Korea. This plan is presented as the result of close consultations between Washington and Seoul, and to impress upon North Korea the seriousness of the proposal, the U.S. and South Korea planned to brief the DPRK before the public announcement. In the same vein, the U.S. was hoping Russia would use its diplomatic representatives in Pyongyang to convey the seriousness of the proposal. This paper, apparently prepared for trilateral talks with South Korea and Japan, lays out the points of consensus among the three governments regarding the situation in North Korea. Essentially, while North Korea remained in a steep decline economically, the regime under Kim Il Sung’s son, Kim Jong Il, remains in control. The paper outlines the evidence for deepening economic ills in North Korea, and outlines the key points surrounding the question of further food assistance to the country. Important questions here involved the balancing of humanitarian concerns with other policy goals, and how to relate food aid to the four party process. In any event, the U.S. saw the burden of any new aid falling primarily on South Korea, Japan and China. This paper discusses the mixed record of success in U.S. policy goals for Korea. On the plus side, good progress was being made on the Agreed Framework, with the canning of spent fuel underway at Nyongbyon under IAEA supervision. On the other hand, efforts to foster a meaningful North-South dialogue seemed stalled, as Pyongyang continued to resist official talks with Seoul. The record for bilateral U.S.-DPRK talks was also mixed. Meanwhile, serious challenges still faced the establishment of the Korean Peninsula Energy Development Organization (KEDO), including securing adequate international financing, though South Korean participation in KEDO delegations had served to reduce Seoul’s concerns about being left out of the arrangement. Despite continued problems on specific points, the U.S. assessed North Korean cooperation as “good” so far. 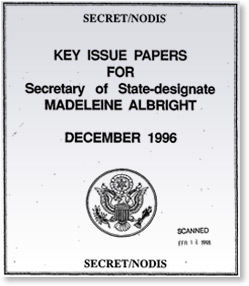 This paper, prepared to brief Madeleine Albright after her nomination as Secretary of State in Bill Clinton’s second term, provides a concise summation of U.S. policy goals and concerns on the peninsula, as well as pressing near-term issues. Significant points that emerge from this document include the statement that the U.S. and South Korea had “cooperated to prevent the precipitate collapse of the DPRK, since it would present unacceptable military risks and economic costs,” as well as the acknowledgement that strains had arisen between Washington and Seoul over North Korea policy, fostered by general resentment in South Korea of any U.S. interaction with North Korea and specifically in the wake of the September 18 incident in which North Korean infiltrators were discovered entering South Korea from a submarine, leading to firefights and a search that extended into November. Despite these South Korean concerns, the U.S. had continued to move ahead in bilateral discussions with Pyongyang on a variety of issues free of “ROK manipulation,” if not resistance, including preparations to open liaison offices in their capitals, recovery of the remains of U.S. soldiers who died north of the DMZ during the Korean War, and negotiations on DPRK missile development and exports. This paper, also prepared to brief Secretary of State-designate Albright, provides a one-page overview of U.S. policy regarding the Korean peninsula. While recapitulating much of what was included in the longer Issue Paper, noted above, it also provides a neat summary of the potential pitfalls facing the U.S. in pursuing its multilateral and bilateral diplomatic objectives. These included possible provocative actions by North Korea or internal problems, such as the deepening food shortage; persistent funding problems for KEDO; and potential Congressional interference, based on doubts about KEDO’s effectiveness and concerns about South Korea being neglected in the U.S.-DPRK talks. This INR memorandum addresses the range of problems plaguing implementation of the Agreed Framework. Noting U.S. assessments that Pyongyang might already have enough plutonium to build one or two nuclear weapons, the paper underscores how failing to implement the Framework agreement will undermine the IAEA’s ability to provide a historical audit of the North’s nuclear activities in the past or prevent the production of more plutonium in the future. Key to curtailing the North’s ability to reprocess spent fuel into plutonium was the ongoing canning of the spent fuel, a process that had run aground on the decision by South Korea to suspend the light water reactor project, which led the DPRK to shut down the canning operation in November 1996 in an effort to force Seoul to reconsider its decision. In this memorandum, Stapleton Roy attempts to provide Secretary of State Albright with some historical perspective on the historic North-South summit in Pyongyang. His basic argument is that while there was much that was new in the summit, “Pyongyang is carrying out policies that have been much discussed in the leadership and, in some cases, were formulated and partially deployed years ago. What appears to be a new, more lively North Korean approach is really a return to familiar patterns, temporarily suspended after the death of Kim Il Sung. … The North Koreans have survived, independent and prickly, among their larger neighbors precisely because they have not had an ideologically rigid foreign policy. On the contrary, the policy has reacted to changing circumstances in and around the peninsula. Kim Jong Il was a party to that policy for many years, indeed, he helped shape it” The rest of the memorandum provides Roy’s evidence for this argument, citing events going back to the 1980s. This memorandum lays out for her approval the scenario for Secretary of State Albright’s historic trip to Pyongyang in October 2000. As Roth indicates, the DPRK planned to “roll out the red carpet” for Albright, and would cooperate fully to make the visit a success. Key to the show of cordiality was Kim Jong Il’s imprimatur on the visit, though this also brought a degree of uncertainty into the plans, as the schedule could change unexpectedly as the result of his whims. Looking to the recent visit of South Korean President Kim Dae Jung to Pyongyang for guidance, Roth argues that this “element of unpredictability” meant that Albright needed to remain very flexible and open to extending her visit to two days in order to reap the maximum benefit from the discussions with the North Korean leader. Roth also noted the hope that the trip might provide the occasion for serious discussions on bilateral issues between the U.S. and North Korea, including missiles and terrorism. The memoranda of conversation recording the meetings between Secretary Albright and Kim Jong-Il during her October 2000 visit to North Korea have not yet been declassified. However, the quotations provided in Secretary Albright’s memoir where she discusses her visit are clearly taken from these memoranda, and are here provided as additional information and context for understanding the nature and results of their meetings. To provide additional context and information about Secretary Albright’s visit to Pyongyang, the text of her remarks and press briefings given during the trip, taken from the State Department’s archived website materials from the Clinton administration. This document provides a checklist of points Secretary of State Albright wanted to make when briefing Russian Foreign Minister Ivanov on her recent trip to Pyongyang, among other subjects. Interesting observations include Albright’s assessment of Kim Jong Il as “someone who is practical, decisive, and seemingly non-ideological.” Albright also planned to express U.S. gratitude to Russian President Vladimir Putin for his help in relaying to Washington Kim Jong Il’s proposal for exchanging satellite launches for long range missile restraint, which is part of the ongoing U.S.-DPRK dialogue on missile technology. For background on the North Korean nuclear weapons program, including estimates of its possible stockpile of weapons, see CRS Issue Brief for Congress: North Korea’s Nuclear Weapons Program, updated May 6, 2005, available at http://www.fas.org/sgp/crs/nuke/ IB91141.pdf, as well as National Security Archive Electronic Briefing Book No. 87, North Korea and Nuclear Weapons: The Declassified Record, edited by Robert A. Wampler, available at https://nsarchive.gwu.edu/NSAEBB/NSAEBB87/. See for example Burt Herman, “N. Korea Talks May End Without Agreement,” Washington Post, August 3, 2005; Burt Herman, “U.S., N. Korea Differ on Nuclear Activities,” Washington Post, August 5, 2005; Edward Cody, “North Korea Talks Adjourn Without Agreement,” Washington Post, August 7, 2005; Edward Cody, “N. Korean Demand Torpedoed Arms Talk,” Washington Post, August 8, 2005; Ji-Soo Kim (AP), “North Korea Still Facing Food Shortages,” Washington Post, August 9, 2005; and Ji-Soo Kim (AP), “S. Korea: Peaceful Nukes in North Are OK,” Washington Post, August 11, 2005. The literature on this topic includes Chuck Downs, Over the Line: North Korea’s Negotiating Strategy (The AEI Press, 1999); Scott Snyder, Negotiating on the Edge: North Korean Negotiating Behavior (USIP Press, 1999); and Leon V. Sigal, Disarming Strangers: Nuclear Diplomacy with North Korea (Princeton University Press, 1998). Important first-hand accounts of dealing with North Korea include that provided in former secretary of state Madeleine Albright’s memoirs, Madam Secretary (Miramax Books, 2003), and the extensive account of the negotiations leading to the 1994 Framework Agreement found in Joel S. Wit, Daniel B. Poneman and Robert L. Gallucci, Going Critical: The First North Korean Nuclear Crisis (Brookings Institution Press, 2004). A fascinating window on how frustrating Pyongyang could be to its communist allies is provided in the documentation being collected by Korea Initiative, headed by Dr. Kathryn Weathersby, at the Cold War International History Project, housed at the Woodrow Wilson International Center for Scholars; see for example “Newly Available Evidence Offers Insights into North Korea’s Thinking, Actions “, by Dana Steinberg, Wilson Center staff writer, April 25, 2005, at http://wwics.si.edu/index.cfm?topic_id=1409&fuseaction=topics.item&news_id=116812.